The only sewing thing I did on Sunday (in the air-con at my friend's place) was to separate out all the red buttons from the vintage stash I was given last year. These are pre-1965, and as much as I like the larger button, they're coat size and far too large scale for a dress. Given my sewing deadline, I shouldn't be so excited that I slept in until 6.30am today, but I am. The cool change has made it easier to sleep, even though the heatwave returns on Friday. Edited to add: In my lunch break I pinned all the darts, so that I can start stitching as soon as I get home. 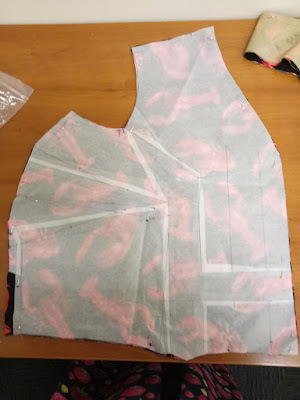 I'm fudging the waist dart on the front bodice, partly because I did a dodgy split of the side dart, which meant something creative to keep the arms of each dart the same length. Ultimately I'm doing this by the seat of my pants. I also cut out the interfacing for the collar and facing, so they're also ready to go.